I think we all appreciate and enjoy when we can buy or receive products that have been custom made especially for us. It’s hard to find a unique gift or something that stands out in the crowd of mass-produced items these days. Enter māk•a•boo, with a line of personalized products that are easy and fun to purchase! māk•a•boo launched in 2009 with the goal of becoming the premier online shopping destination for high-end personalized gifts. Featuring well-known lines such as Angel Dear, Bella Bliss, Kissy Kissy, and Swaddle Designs, māk•a•boo offers their one-of-a-kind personalization, embroidery and beautiful gift wrap for free with the purchase of each item on their site. For my review, I was able to order my own product in order to experience the process of personalization. 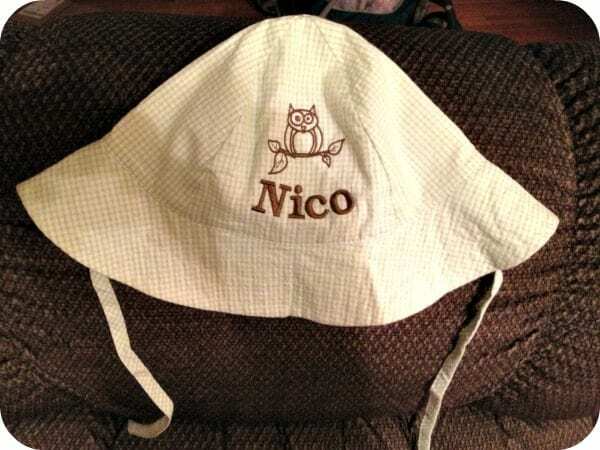 It was simple and easy to design my own hat for my son. I chose the Bella Bliss sun hat which is made from 100% cotton and comes in sizes from infant to kids. There are five styles/colors to choose from including the green gingham style that I chose. I really liked the size and definition of the pictures provided. The picture accurately reflected the color of the product I received which is extremely important when it comes to shopping online. The personalization process was straight forward and it was fun to try different combinations of icons and text. There are so many options- text only, icon only and two different layouts for icon and text combination. The icons range from animals to holidays and everything in between. I love the style of the graphics. I had three color options for my embroidery. Again, the images I was shown in the preview match the product received. This interactive display is as close to purchasing these items in a store as you can get while still shopping online. I felt that it was very simple to personalize and create my own hat. When I received the product (within a week which is an excellent turn-around time on a personalized product), I thought the packaging was classic and elegant. 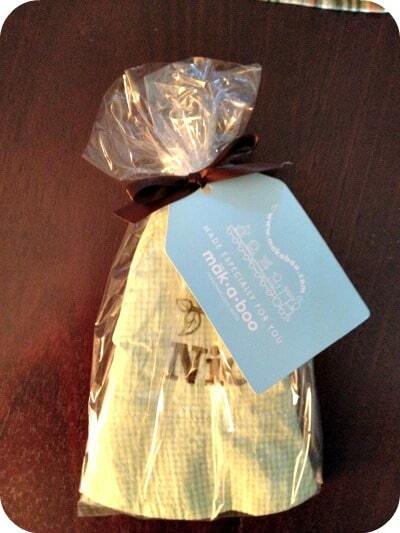 I love that you can send any of māk•a•boo’s products as a gift without any extra steps in the ordering process and no extra cost. All items automatically arrive presented in a clear cellophane bag to show off the product and is tied with a satin bow. I think this adds that extra special touch that I personally appreciate. I do a lot of online shopping because I have many family and friends who live far away and direct shipping is the easiest way to send gifts. māk•a•boo is a great choice for people in similar situations because it’s so much more festive to receive an attractively wrapped package as opposed to an item that is just tossed into a cardboard box. The quality of the product and the embroidery was also superb and everything appeared as I had requested. The hat itself is adorable and I love the appearance of the owl icon I chose! I feel the product is a great value considering all of the special touches that are available to the purchaser for free. Hats are just one item of many that māk•a•boo personalizes. Visit māk•a•boo today to see their full line of products which includes lovies, blankets, burp clothes, bibs, clothing, organics, gear and more. You can also visit their storefront location in St. Louis, Missouri. What a great way to send a personalized gift! Thanks for sharing!!! Kind of pricey, but they do have cute stuff. wasn’t to sure what the review was about, but when I got to the second page and saw that stinkin adorable hat, I was in love, how cute! I love that it is personalized. These are really great, what a wonderful gift one of them would make! Love the hat! It is nice when you can personalize a gift. It just seems to add a special touch of caring. Plus, it can be really fun! Glad it is easy to do on their site. Never heard of the but will have to check it ou.